Desde Juventud y Cultura queremos felicitar a Claudia R. y Elvira F. por haber sido merecedoras de la beca Jackie Sant-Myerhoff. Desde aquí animarles a que sigan trabajando como hasta ahora. ¡Muchas felicidades! 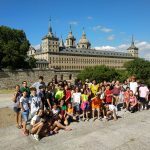 Jackie Sant-Myerhoff ha trabajado, durante más de 34 años, en una de nuestras organizaciones colaboradoras, Cultural Homestay International, en Estados Unidos dedicó su carrera a organizar programas de intercambio de estudiantes con el objetivo de difundir la comprensión y cooperación intercultural. Jackie falleció en octubre de 2015. 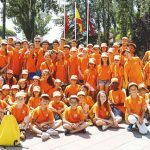 Sus compañeros de trabajo, en conmemoración a su devoción con los estudiantes de intercambio, crearon esta beca para brindar la oportunidad de de estudiar en Estados Unidos a estudiantes seleccionados por su excelencia. CHI is pleased to announce the first winners of the Jackie Sant-Myerhoff Scholarship, Claudia Recalde and Elvira de la Fuente, high school exchange students from CHI’s long time Spanish partner, Juventud y Cultura. 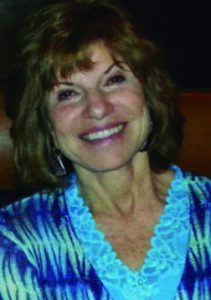 Jackie Sant-Myerhoff, Director of CHI’s Educational Programs, passed away in 2015. A committed champion of student exchange programs, Jackie believed overseas high school students are deeply affected by their exchange experiences while living in the U.S. and go on to become future world leaders. CHI created the Jackie Sant-Myerhoff Scholarship to honor her lifetime contribution to student exchange. 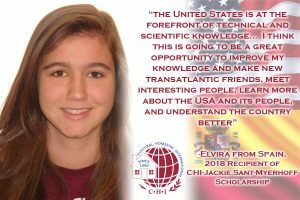 Our first recipients of this award, Claudia Recalde and Elvira de la Fuente are exceptional young people who look forward to their exchange year in the U.S. Cultural Homestay International operates eleven cultural exchange programs throughout the United States and around the world. Since 1980, CHI has brought more than 300,000 students to the U.S. from 136 countries, welcomed by over 150,000 American host families. CHI’s mission is to promote international understanding and goodwill through people-to-people exchanges, believing that the best way to build bridges of friendship and trust among people is to experience personally each other’s customs, languages and values.